Action cameras made by Thieye have always been known for their amazing quality and value for money. The action cam we’ll be taking a look today, the T5e, one of the first action camera that features real 4K and costs only $150, which really made the whole action cam industry a whole lot more competitive. But is it really that good, or is there a caveat to it? The 360˚ swivel mount, unique to Thieye’s action cameras, is one of my most favourite mounts because you can make easy fine tuning simply by rotating it. However, that having said, it isn’t more compatible with the more universal GoPro or SJCAM mounts as it is shaped a little differently. In addition, it also comes with a 60m waterproof casing so if you’re planning to shoot while diving, snorkelling or anything underwater, the T5e is perfect for that. All in all, the accessories built by Thieye are extremely good in quality. These remote control helps to control the camera wirelessly. You should definitely consider one if you’re planning to mount it on your body or simply take wefies with your close ones as you wouldn’t have to inconveniently reach for the camera to start or stop shooting. The difference between the 2 remote lies in that one can be used for voice control whereas the other can’t. A battery on a single charge lasts about 74 mins on 1080p 120fps and 45 mins on 4K 30fps, which, although is average amongst action cams, is still quite short. Thus, if you’ve multiple action cams or plan to use one extensively (say on a full day vacation), getting an external charger would certainly help make charging easier and faster. If you’re planning on using the T5e when underwater, be it snorkelling, diving or even swimming extensively, you should definitely get one of these filters. Right off the bat, it feels well-built and durable with its aluminum matte finish to it. Moreover, the body is also shaped quite similarly to traditional action cameras, with the mode/power button at the front and the card slot at the side. I also really like the tripod socket at the bottom because with that, you can conveniently mount the camera to your selfie stick or tripod without having to put it the waterproof case. Furthermore, the display is also really bright and clear even in very sunny and bright places, which is awesome for reviewing the shots you took. As for interface, you have 4 modes to select from (photo, video, playback & settings). I also found the navigation system to be overall, very neat and easy to use, which makes it great for you if you’re generally new to action cams. There’re also a wide variety of customisations that you can adjust to fit your shooting needs. Learn what all the settings mean here! The latest firmware version is V5.1. Although it’s most probable that your T5e is using the latest firmware, just in case it’s not, click here to go the link to update. Now, let’s take a look at what may be the most important factor when choosing an action cam: the image quality. Below are some of the many customisations that you can adjust to your liking. Also, another thing I disliked is that when any of these features (except stabilization) below are enabled, it’ll affect both video and photo, which can be quite a hassle if you want independent settings for both of these modes. The awesome thing about the image stabilization is that it’s really good and helps remove mini bumps and tremors, though it’s definitely not able to replace a gimbal. However, as great as it is, it only works with 1080p 30/60fps due to hardware limitations. The SuperView on the Thieye is actually identical to the one on GoPros. Superview is great for getting immersive action, moving shots where the main focus is around the centre, so you’ll want to avoid scenic or people shots where it’s important for the whole scene to remain undistorted. Most action cams have distortion ‘built in’ to it because of the shape of its fisheye lens. However, luckily, the T5e has the ability to edit the distortion though there’s less field of view present. I always keep this feature on because the threshold for this feature to be enabled is very high thus it won’t be switched on accidentally. However, just for the sake of experimenting for you guys, I decided to play around with it and you can see from this that it indeed improves the low light quality of the image. From the app, you’re able to remotely control the camera from your phone to start and stop recording and view your footage that you’ve shot previously. However, the most important purpose of the app is to transfer the footage, which works very well and reliably, much better than many apps that I’ve used. There are also a few editing filters and customisations as well, which is nice to have, as it’s not very user-friendly, I definitely still prefer to use my own editing app to do the editing. Overall, it’s a really great app because to its stable interface and relatively quick transfer speed. If you didn’t already know, the T5 and T5e are identical action cams with similar specs, with the only difference being the packaging they come with. As for T5e and the newer T5 Edge, although they look very similar, they’re completely different action cams with different hardware and specs. From what I can see, the T5 Edge provides way more value for money and it’s no doubt since T5 Edge is the newer and more updated action cam after all. Thus, if you’re interested in the T5 Edge, definitely check out my full review of it here! 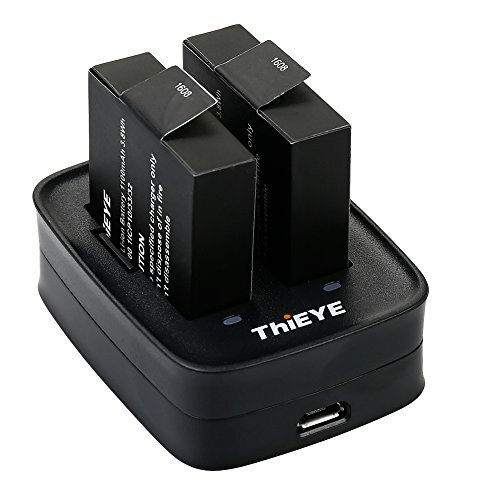 From what I can see, the Thieye T5e is certainly a great action cam as far as I can see. The image quality is really sharp, the controls are super intuitive and even the accessories provided were well-built and, as a whole, it was really pleasant and felt stable using it. All in all, despite the T5e not having many of the bells and whistles the GoPros have, it costs less than half that of a GoPro and is still an good all-rounder action cam that does what it’s supposed to do amazingly. Thus, you can’t go wrong getting the T5e. However, all that having said, I’ll still recommend the T5 edge over T5e, which is a very similar action cam to the T5e because, at a much lower price point, it has more features (such as voice controlled remote control, 4K image stabilization and live streaming) and does not fall behind the T5e in any particular aspect. Hence, if you’re interested, check out my full review on the T5 Edge here! The T5e has a external mic that works great and that is a huge advantage over the T5 Edge. The only issue is the port is slightly recessed and most 2.5 to 3.5 adapters don’t fit. Though you can purchase the Thieye adapter and Mic that does fit and works great for 7 to 14 dollars depending on where you buy it. Hi Snorkel, can you give us an example of one? Cheers! Here is the official page at thieye web page. I got mine from amazon and the adapter is slightly longer and fits the cam perfectly and fully seats with no mods to the cam or the mic.